These last two weeks have gone by in the blink of an eye. Jonas’s has been able to produce an incredible 17 different sample boards. 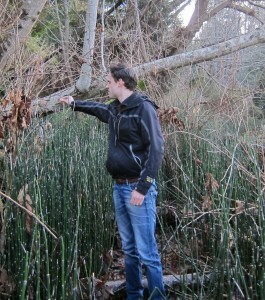 I think it must be a record if anyone is measuring such things. I have done a mere three boards that represent techniques that are new to me. 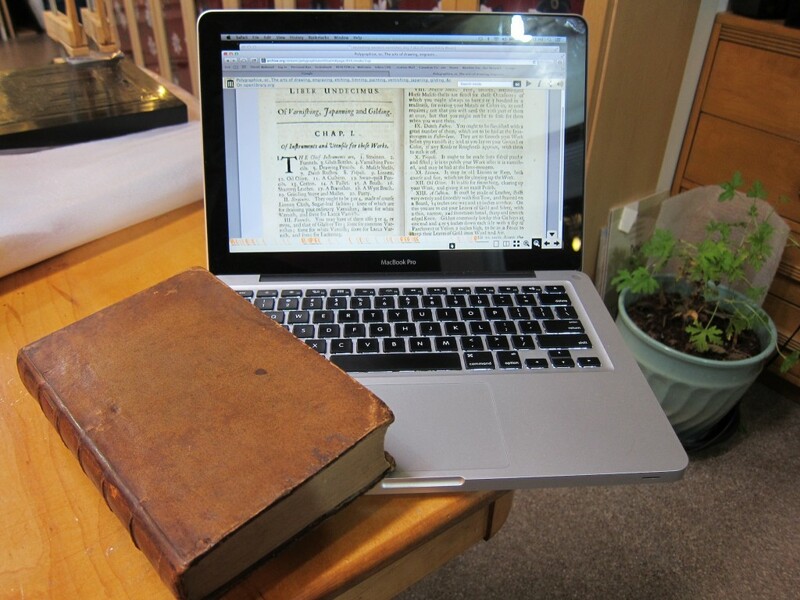 In keeping with our study of these 17th and 18th century recipes we have been keeping industrial revolution work hours as well. Work begins promptly at 8 am and continues until 6pm with a leisurely 20 minutes for lunch. Then after we each head home, for a supper of pizza at the hostel for Jonas, and microwaved spaghetti for me, we each settle in for the evening’s work. By the light of our computer monitors we edit photographs and write up the blog. Bedtime for me this week has been routinely around midnight. It all seems to fit well with the spirit of the project. Today we are posting the final day of working on the boards and early next week we will post our conclusions with photograph’s of the recent boards and ones I have made in the past. Today we experimented on how to lay gold speckles onto our varnish. Originally this sprinkling technique came from the Asian lacquer tradition. But there are of course other manners in the way of application. First I will explain on which manner we speckled our panel and will inform what the difficulties where in the process of application. Following I will compare our technique with western ways of application using historic literature. First we took the leaf gold and laid it in the sieve. Next we applied another layer of seedlac varnish on our sample board. (Usually the speckles are to be laid on the surface before making the raised areas). 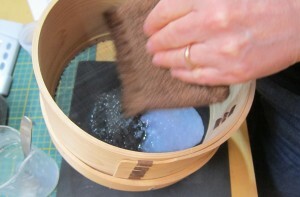 For the following procedure you have to be quick because it is the purpose to lay the speckles in the still wet varnish. 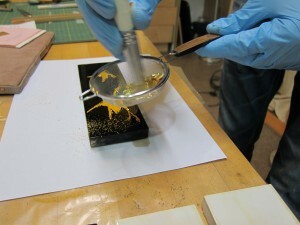 Then the gold is rubbed through the sieve using the stencil brush. Like I said you have to be quick but you must also be aware that the gold speckles are spread evenly. When I reflect on my first application I was so busy to be quick that I totally forgot to spread the gold evenly. The result is like the two birds are flying in a snowstorm, also nice but was not what I had in mind! When the varnish partially dry the gold speckles had to be pushed down into the varnish layer because of the reason the speckles had to be covered with varnish to make a flat surface. The next step is to put on layers of varnish until the speckles are covered with varnish to make a flat and glossy surface. When we compare our technique to the Stalker and Parker book there are some differences. They say you first have to prepare your speckles (probably with a sieve or something similar). The speckles are to be added to the varnish and they advise that the quantity of speckles is not comparable to adding pigment in a lacquer dispersion, instead it is to be added in a much smaller degree. Then the speckles have to be stirred into the varnish. A couple of coats have to be applied on the panel until the speckles are evenly spread. To cover the speckles several coats of varnish are needed (Lacquer mixed with Venice turpentine). If you want to polish your work the following is required; “…having done everything as above directed, tis required that you give it eight or ten washings of your best Lac-varnish being al successively dried on, you are at liberty to polish it”. Reflecting on the technique we have some questions; if the gold speckles could spread out evenly on surface. On the other hand, the speckles are already in the lacquer mixture covered with lacquer so this may affect the quantity of layers needed to cover them completely. The lacquer mixture with the Venice turpentine used for the following layers will make a thicker lacquer what apparently will result in less layers to cover the speckles completely. So on the Asian way one has more control on spreading the speckles evenly but there are probably more layers needed to cover the surface entirely. By the western way there are probably less layers needed to cover the surface entirely but we think it maybe difficult to spread the speckles evenly. 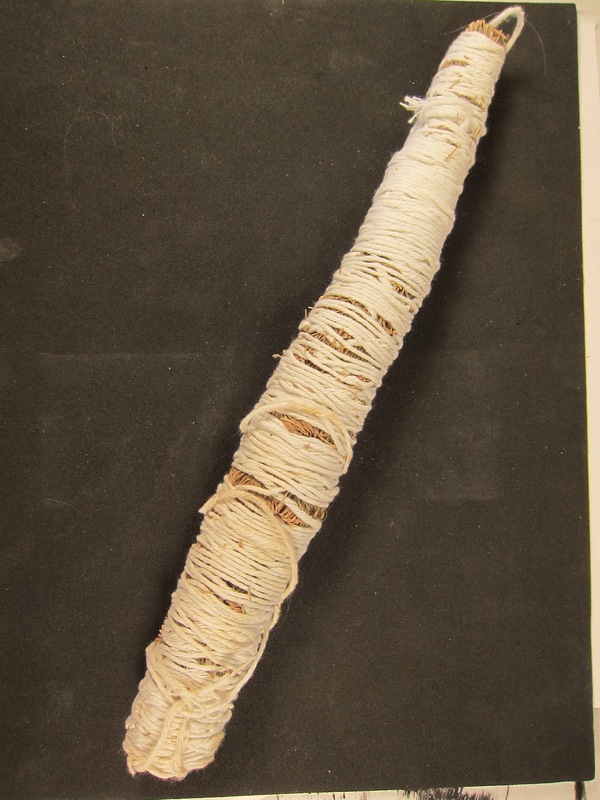 Acrid smells and the hint of something burning instantly sent conservators into alarm mode. It did not take them long to track me down with my chemical oven full of copal varnish. This was the scene some 15 years ago at the ROM when I was interested in studying the oil/copal varnish recipes. I produced a number of panels and small papier maché boxes before my colleagues persuaded me to discontinue the project. 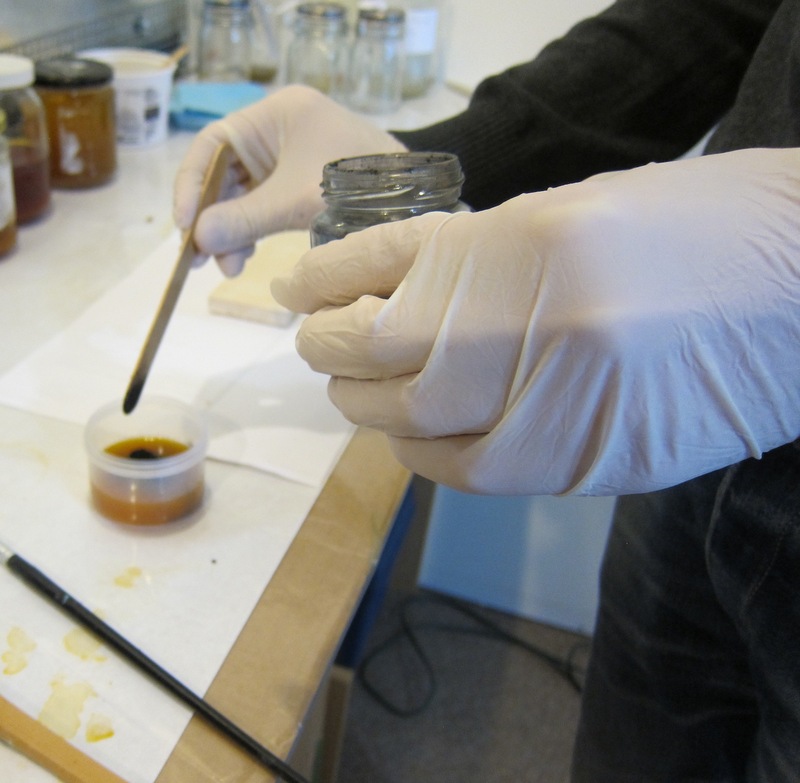 Unlike the spirit varnishes we are preparing for this study,in which the ingredients are dissolved in ethanol, oil copal varnishes are made by mixing hot linseed oil with melted copal resin. The final varnish can be thinned with turpentine. Metal and paper maché products coated with this type of varnish were dried in an oven for several hours or days. This hard durable coating could be polished to a mirror like finish. I have always wanted to spend more time researching this type of western lacquer but not had the time. Fortunately others have. A good article by Christopher Augerson that was recently brought to my attention was published in the Journal for AIC, Spring Summer 2011 issue (Vol. 50, Number 1). 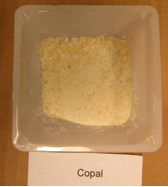 Not only is it an excellent description of the copals available, the chemistry, and production of the varnish, but he has also included an extensive bibliography of recent and historical articles. It will provide you with reading material about resins and western lacquer long after this blog ends. 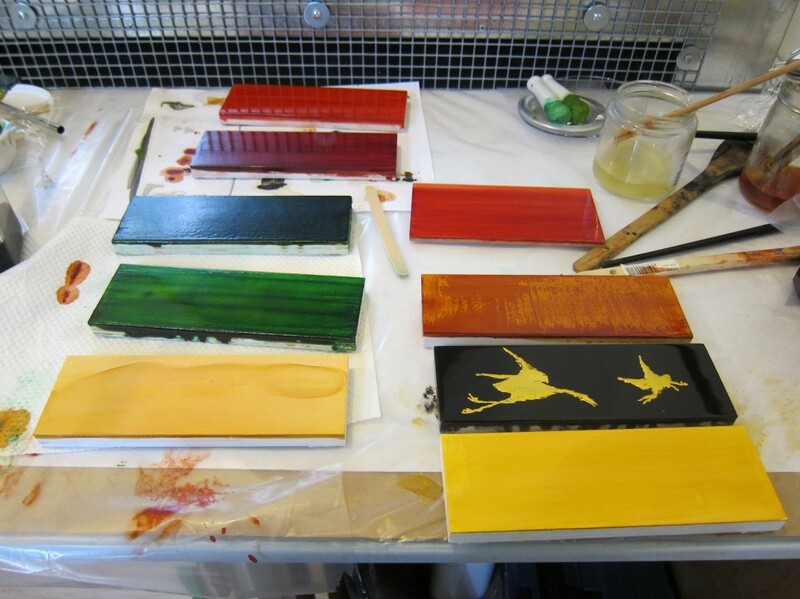 To practise on decorative techniques in lacquer we used one of the black panels to do some exercises. Today we will make raised figurations on the flat surface of one of the black panels. 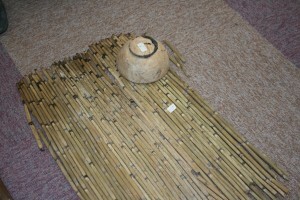 The reason of this practise is to obtain a better view of the possibilities and restrictions of the material properties. First the designs were chosen from the Stalker and Parker book. The figures were drawn on a piece of paper that was later laid over yellow ’carbon” paper on the surface of the sample-board. The drawing was traced using the carbon paper, leaving the outlines of the figures behind on the panel. Next a small amount of shellac varnish was saturated with calcium carbonate (CaCO3), similar to the preparation of gesso. In fact, also gesso could be used for making such raised sections. Next we had to decide what sections of the figures should be raised; in this case these were two birds. 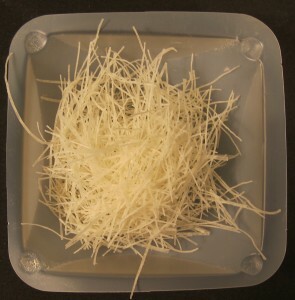 Normally western raised sections contain only big volumes; details like the legs or nozzle’s were usually left unraised mainly because of the limitations of the material. For the two birds on the sample board I chose to raise the whole volume to experience the limitations of the material and to learn from it. 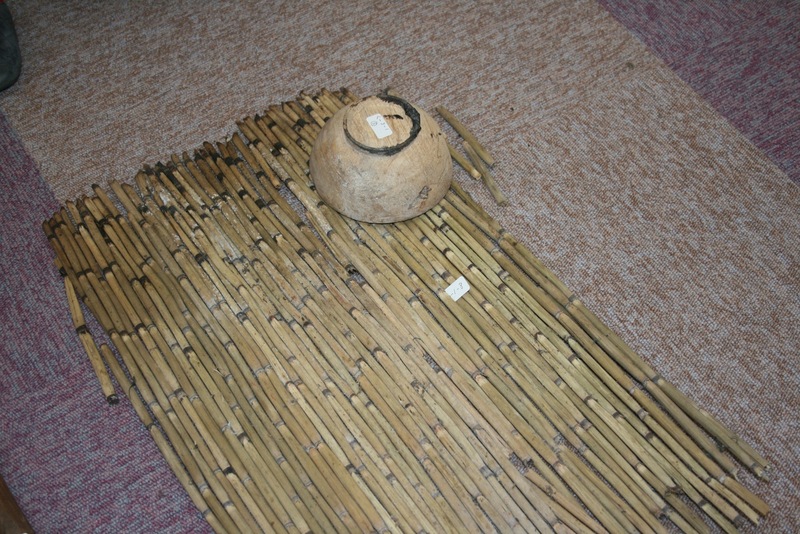 The lacquer mixture was to be applied using a little stick. During this process the mixture should follow the outlines of the figure. If you apply too much in a thin area the mixture flows easily over the line, so you really should be aware of the quantity you apply. This flow capacity is also the main reason why refined details are really hard to accomplish. This is opposite to Asian lacquer, where really fine details can be made. So, after the big volume of the figures was filled in the legs and the nozzles had to be carried out, this did not work very well. There were first areas where too much was added which had a poor result. A smaller quantity had the disadvantage that a straight thin line couldn’t be applied on the surface. Eventually to make these details small drops were applied beside each other but it wan not a good result. After the raised sections were dry they were gilded using leaf gold with oil size. Last week we prepared this precious red lacquer. After it had has been warmed for one week, finally the day has come test it out. 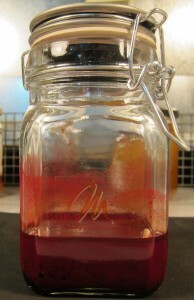 After straining the result was a really thick blood red substance. To our opinion it was even too thick to be used for pigmented ground layers. 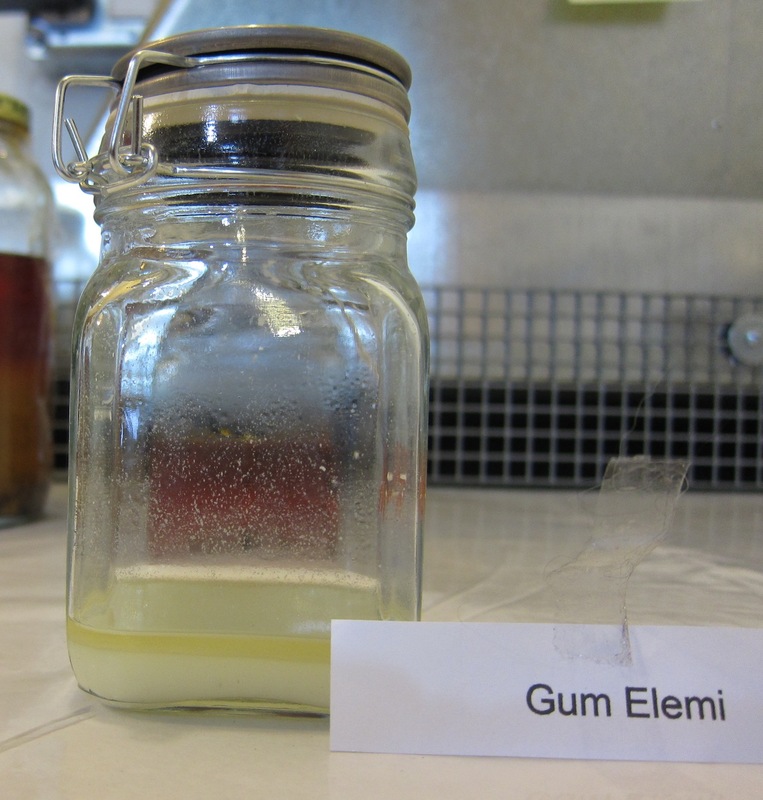 Because of this reason the mixture was diluted using ethanol. 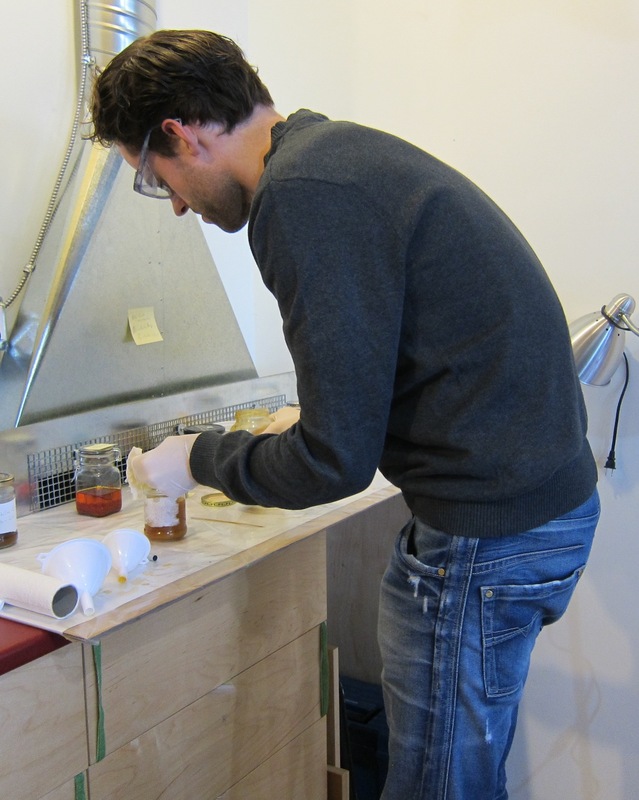 After a good consistence was obtained, four coats were applied to the sample boards (this is what we decided because the recipe gives no direction in the process of application). After the first layers had been laid on we applied another six layers. 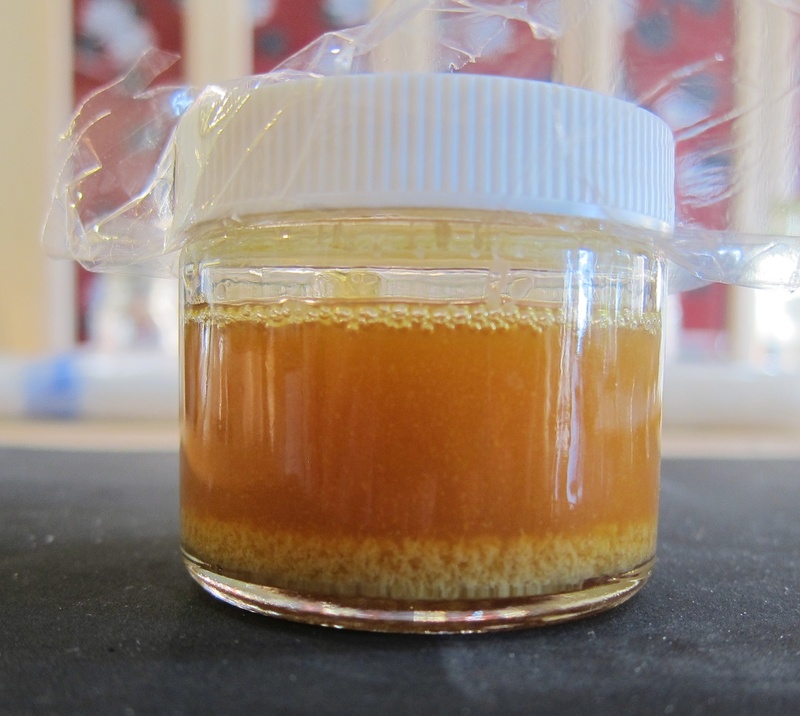 In this case we diluted a portion of the original batch with ethanol in order to create a translucency between several layers of varnish. Reflecting on the properties of this lacquer we have to admit that the lacquer gives no homogeneously covered surface as opposed to the S&P red varnish. This results in an uneven surface, however, it is not a disturbing factor because it creates a really nice depth and translucency. By this reason it could be a compatible varnish to make tortoiseshell imitations. Referring to yesterday, we have two panels one with the seedlac/pigment dispersion and the other one with the white varnish/pigment in it. Today both panels will first undergo a sanding procedure similiar to the other sanding procedures earlier mentioned. After this six layers of pure seedlac or for the other panel pure white varnish had to be applied. For the seedlac this was no problem whatsoever but the white varnish was after three layers too sticky to put more layers on. 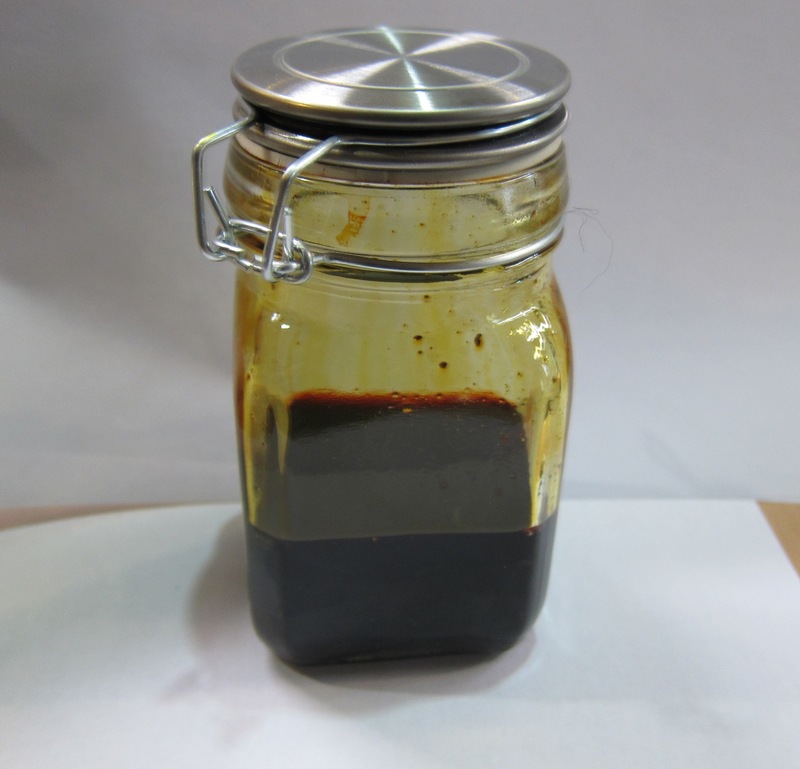 The cause for the long drying time is because it contains a large amount of turpentine in its mixture. Also for this one, after a week finally the day has come to test out this precious varnish. 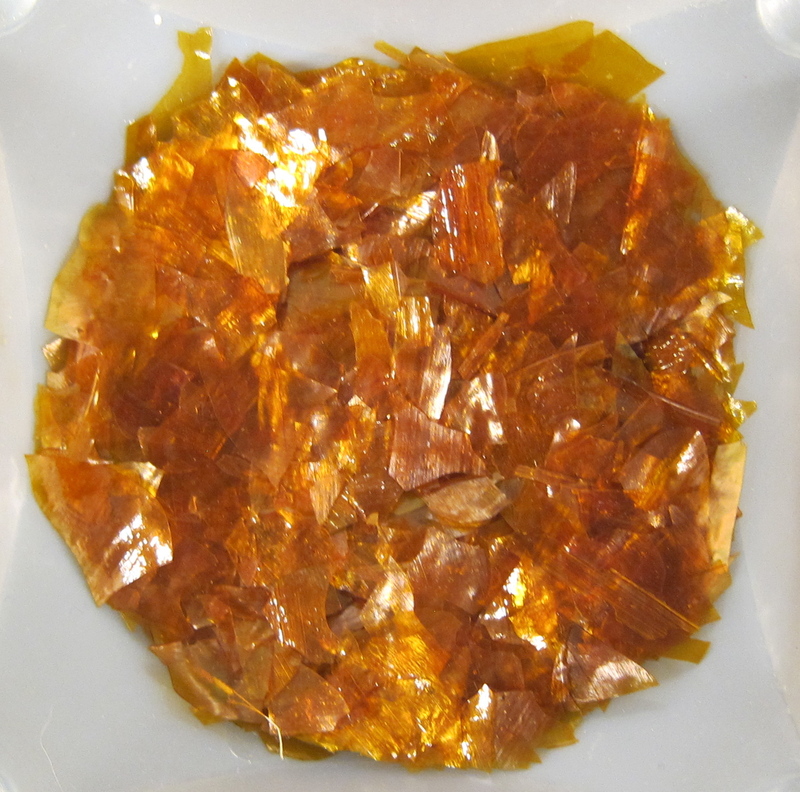 For commencement we had some objections like; is this varnish capable of forming a film because of low amount of resin in its composition and will it make yellow colour because of its ingredients (dragonsblood, aloe and saffron). Well, it became a really thin varnish (like water). 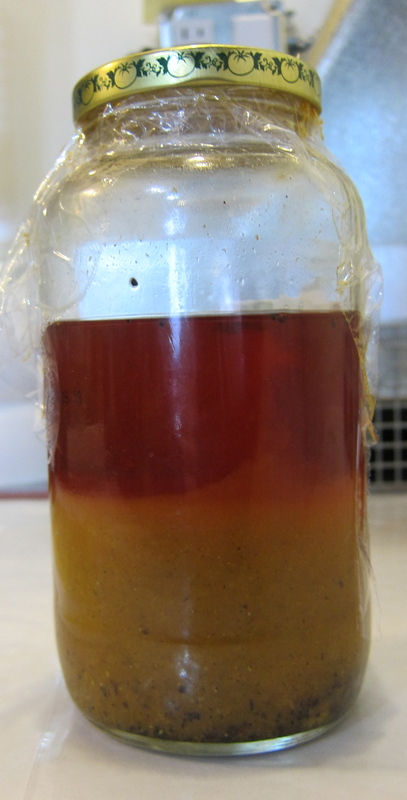 It flows and colours homogeniousely, leaving a yellow colour with a brown tint, yet as more layers are applied this brownish colour may predominate. 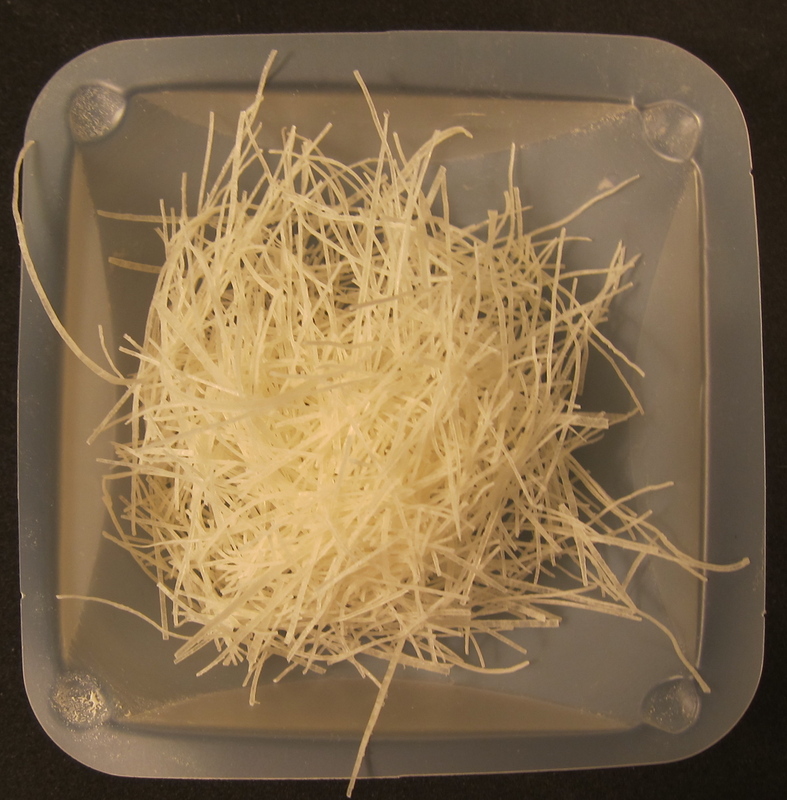 It is capable of forming a film but there are several layers needed and by then the brown colour will predominate. 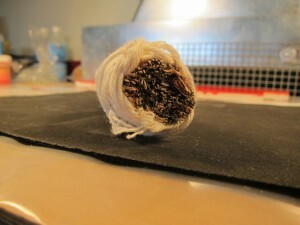 It is not capable of forming a covering layer but acts rather as a dye leaving the layer beneath still visible. 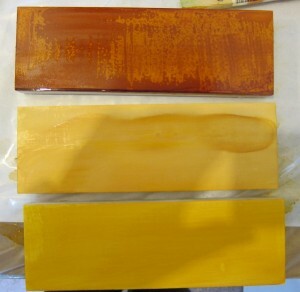 We did several experiments with this varnish: first on a red coloured surface (using the S&P red lacquer as mentioned before), we prepared a sample board prepared with a yellow coloured ground using a gum water/ Indian yellow dispersion(bottom panel in the photo below), we used a sample board with a white ground using a gum water/titanium white dispersion(middle panel in the photo) and a panel only with the gesso ground(top panel in the photo). In the case of the red ground panel it delivered no exceptional difference in colour but a slight gloss was created. On the white ground panel and the gesso ground panel it resulted in a discolouring causing a brownish colour. Only the yellow ground showed a positive result where it increased the yellow colour giving it more strength probably also because of its brown tint, at least as a yellow colour is wanted. What could the use of this lacquer be? Actually in my opinion it should be used as a layer in a lacquer system between other layers where it can act to heighten the colour of a varnish and to cause in someway more depth and translucency. Today’s objective was to try another time if it is possible to obtain a plain glossy surface using the S&P white varnish. For this purpose another sanding procedure was carried out. Eventually the next application of the white varnish was even worse! We’re really curious to see if the white varnish reacts the same way on the blue sample board. As you can see from the photograph above, the boards are really looking spectacular. Today I will catch up on one of the comments I have received. 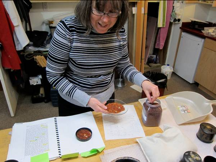 Miho Kitagawa writes that she feels the addition of Venetian turpentine to the seedlac in Stalker and Parker’s black Japan recipe creates thicker layers than seedlac alone. She says perhaps it is better to fill the small dents, holes, and wood grain. 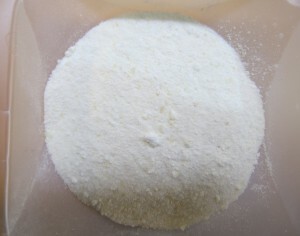 It may also give a glossier surface than ordinary seedlac. At this point there is very little difference in appearance between Jonas’s black panels with and without V. turpentine. They were made according to instructions that the six layers containing V. turpentine are to be covered with six more layers of seedlac on top, which may account for their similar appearance. It will be interesting to see if there is any difference when they are polished. In the long term the Venetian turpentine layers probably act as a plasticizer and will affect the aging characteristics. We will have to revive the blog again in 20 years for the definitive answer. 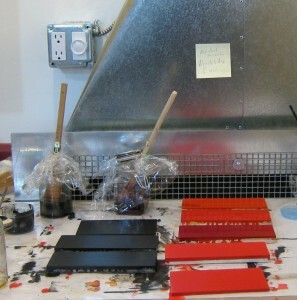 The next step in reconstructing this lacquer is to sand the surface smooth with p600 grid sandpaper. After sanding the surface of the panel we hope to have homogeneous blue colour, leaving no visible brushstrokes. Next three layers of Isinglass size were applied. I assume the purpose of these layers is to act as a buffer between pigmented bottom layers and the layers of white varnish . 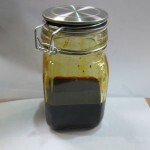 The recipe concerning this lacquer contains several possibilities to make this varnish. Harley. R.D. Artists’ Pigments c. 1600-1835 “a Study in English Documentary Sources”. Butterworth Scientific. London, 1982. Furthermore R. Dossie leaves the choice to the practitioner to mix the pigments with the white varnish or with seedlac varnish. We chose to make two sample boards to see the difference between these two lacquers. The actual lacquer should be applied on a gilded surface to enhance the colour, like the recipe says: “…and they should be laid on a ground of leaf gold, which renders the colour extremely brilliant and pleasing.” The two pigments were ground in the lacquer using a mortar. We did this because the particle size of the verdigris was in our opinion too large to cover the surface homogeneously. First the verdigris pigment was added to the mixture and ground into the lacquer; afterward the Dutch pink was added until a nice green was obtained. When the composition of the lacquer was completed the mixture was applied to the surface of the panel in four separate layers, giving the surface a homogenous green colour. First another sanding procedure was carried using the p600 grid sandpaper before the white lacquer varnish was applied. The first three layers gave actually a really fine result, but the following layers gave suddenly a really bad appearance. On the surface there was some kind of tension making edgy lines. These lines did occur several minutes after application and I believe this has nothing to do with possible brushstrokes because the lines were formed afterwards. For the next day another sanding procedure is planned by which we will sand all these irregularities out, hoping that the following layers will give a better appearance to the surface. 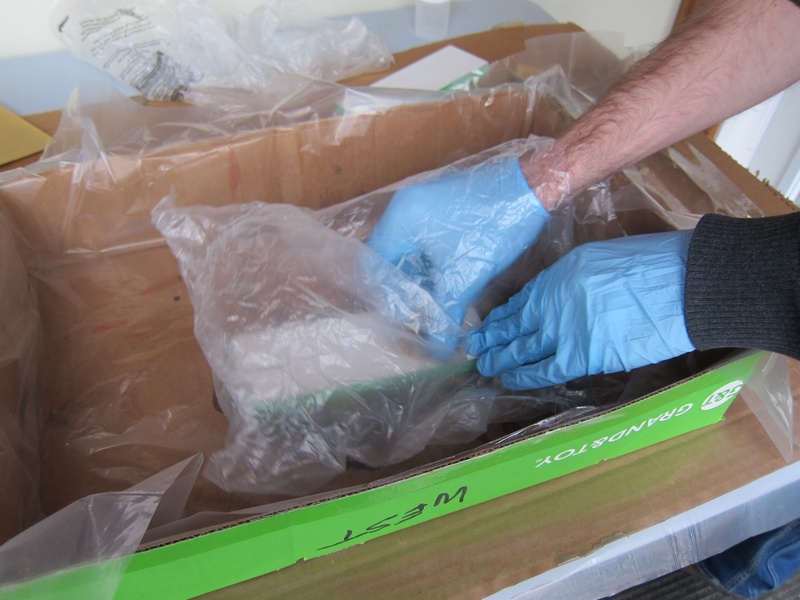 When I am at a party and people ask me what work I do, I usually start with; I am a conservator who restores objects. This is invariably followed by a question on exactly what objects I restore. 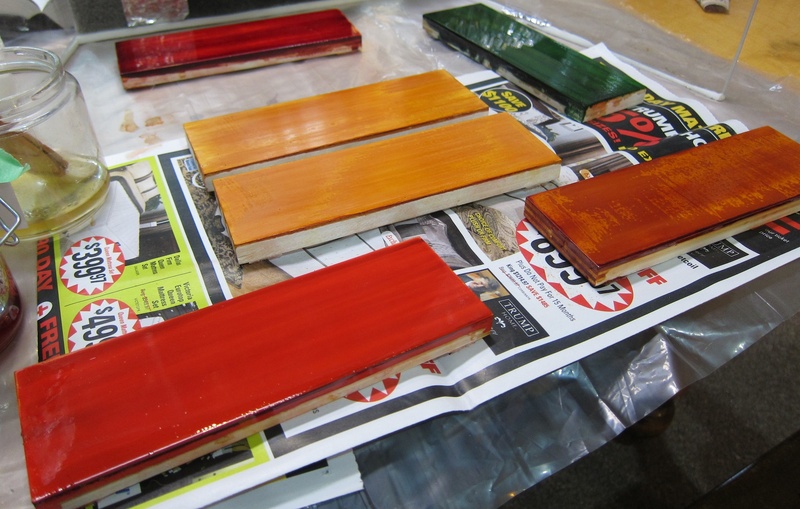 When I say I specialize in lacquer many perk up and demand to know how to fix the scratch in their kitchen cabinets. This where I always get into trouble as I launch into the difference between Asian lacquer, western lacquer and their kitchen cabinets. By this time they start swirling the ice cubes in their near empty glass, mumble something about needing another drink and head to the bar. The word lacquer can be confusing. It can be applied to many different materials with different properties and the meaning has continued to change over time. Today at the end of his post Jonas sorts out some of the historical references to these terms. 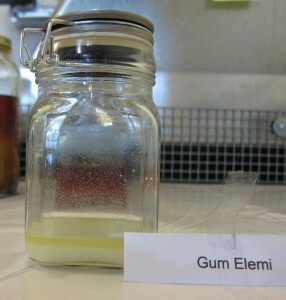 First the lead white has to be mixed with the gum water to make a thick white, paint like mixture. The smalt was mixed with the isinglass size that was warmed to increase the viscosity. 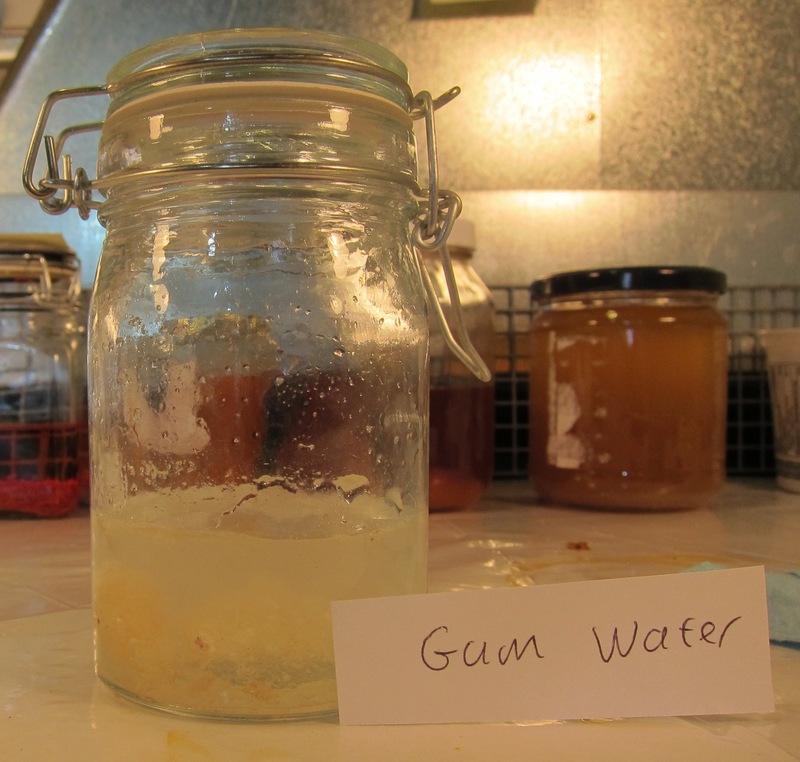 After this the two mixtures were mixed with each other, adding the lead white gumwater to the smalt size to make a nice blue colour depending on personal taste. 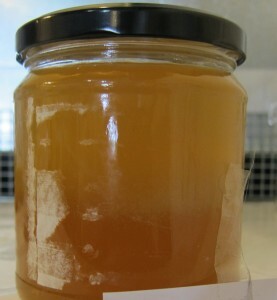 The recipe says “…all these well stirred and tempered together, being arrived at the consistence and thickness of common paint.” It is however not possible to obtain a thick paint like mixture mainly because the viscosity of the gum water, made according to S&P directions, is too low (like water) (fig. 46). 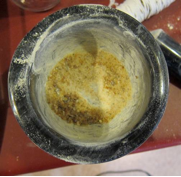 In the process of applying the first layers of this mixture it has to be stirred very well because smalt pigment will sink directly to the bottom (fig.47). 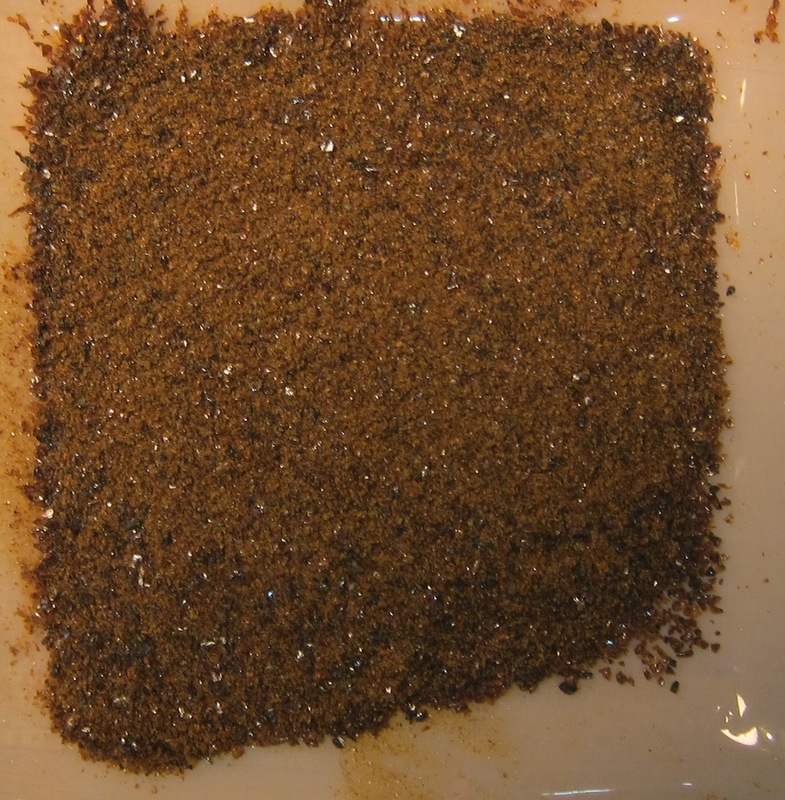 Although we used a very fine grind of smalt, after applying the mixture the pigment particles could be observed on the surface of the sample board (fig. 48). Chemically the composition of smalt (silicate glass) is variable; it contains approximately 66-72% SiO2 (silicon dioxide), 10-21% K2O (pottasium oxide), 0-8% As2O3 (arsenic trioxide), 2-18% CoO (cobalt oxide) and several impurities. 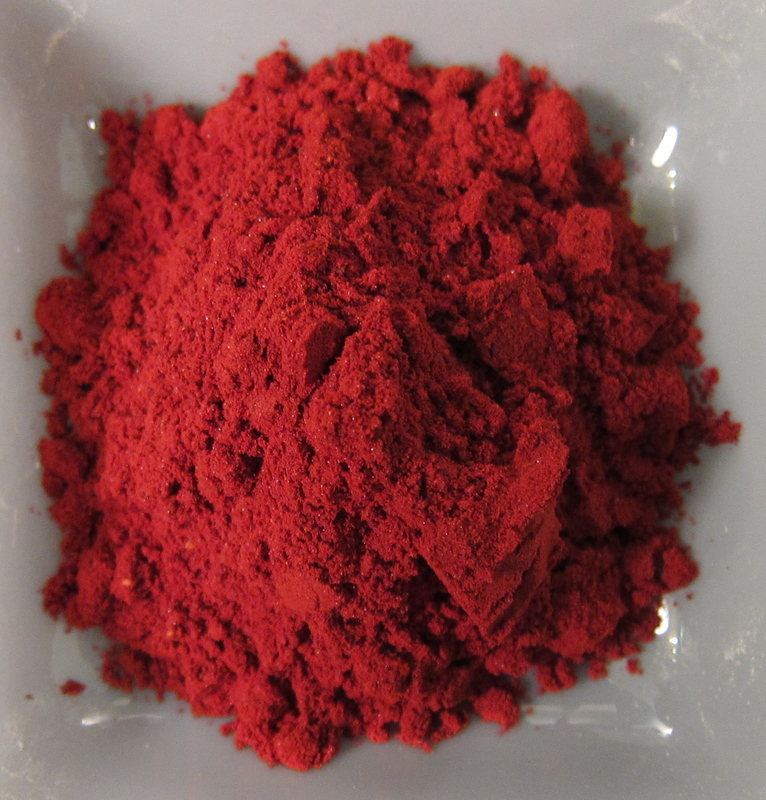 The pigment was used during the 16th and seventeenth century. In the late eighteenth century the use of the pigment declined because of the availability of synthetic blue pigments like Prussian blue. Smalt has a low hiding power and also the colour intensity decreases, as the particles are ground finer. This is why we had to put on several layers to obtain a homogeneous surface. Because of the low index of refraction this resulted in a really mat surface. In total we had to put on 5 layers that had to dry thoroughly between each coat. If not properly dried the previous layer of isinglass would be dragged off. Last week we were talking about lacquers and varnishes. Today I will discuss the terminology of lacquers and varnishes and different uses. The word lacquer, in German lack, in French lacque and Italian lacca comes from the Sanskrit word lãksã or lakh which literally hundred thousand means. One can link this meaning back to swarms of insects (Laccifer lacca) that nest themselves on tree branches from which their secretions are the basis of shellac. 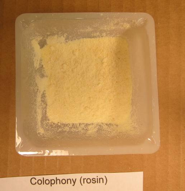 (1) This resin is dissimilar to other natural resins as it is one of the few based on animals instead of plants. Shellac was first arriving in Europe at approximately the same time as Asian lacquer, therefore was often confused. Under this definition one can also include oil varnishes like linseed especially when enhanced with the addition of dryers. Some people have attempted to define the two terms by using lacquer for coatings that dry by solvent evaporation and varnishes for those that dry by oxidation of the oil content. This however, does not fit well because Asian lacquer dries by polymerization followed by oxidation and paintings are commonly ‘varnished’ using synthetic and natural resins. 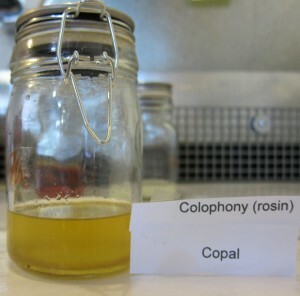 Although there have been attempts to define these terms there is still no specific nomenclature to distinguish layers of resin dissolved in alcohol and coatings consisting of oil and resin. I do not think this will help Marianne at parties. (1) Kopplin, Monica. European Lacquer. Hirmer Verlag. 2010. pag. 14. Yesterday Jonas added dragon’s blood to two of the varnishes we are preparing. 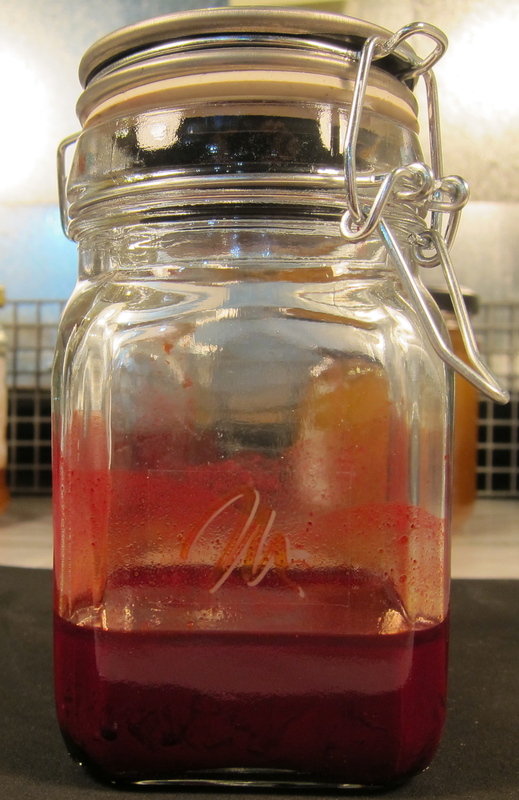 Dragon’s blood conjures up images of alchemists in medieval castles preparing various magical potions. In fact, the name in one form or another has been used since ancient times to refer to a blood red resin. In Roman times it likely came from drops formed by the natural exudation of Dracaena cinnabari found on the isle of Socotra. 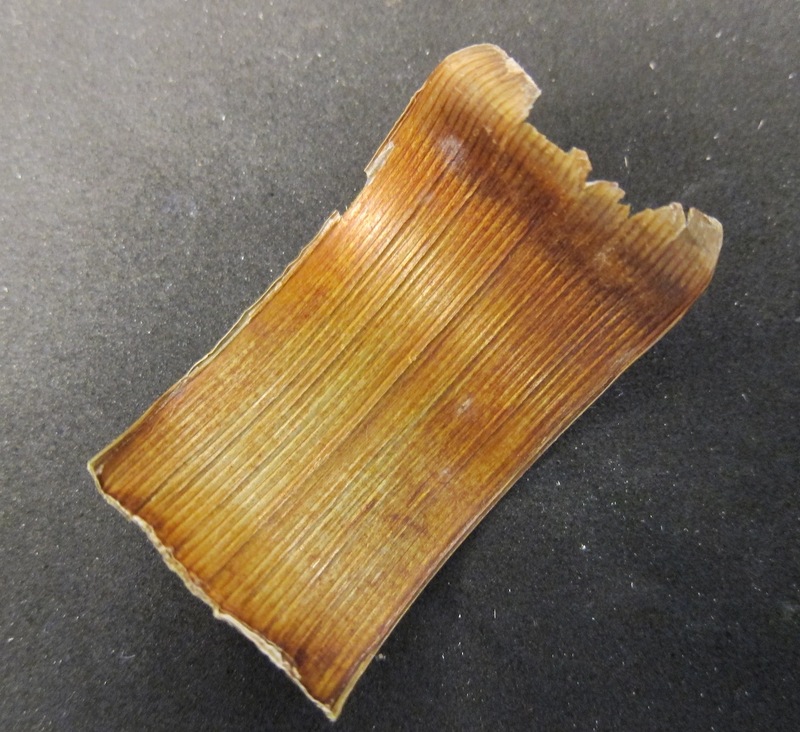 By the 15th century the resin was being collected from the stems of Dracaena draco in the Canary Islands. It is not clear when they started to use the resin harvested from the exterior sheath on the fruit of Daemonorops draco, a rattan palm growing in Borneo, Sumatra and Malaysia. 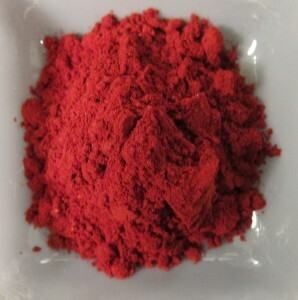 According to Kremer pigment, where my resin was purchased, this is the source to the dragon’s blood we are using. I do not think it will make much difference to the behaviour of the varnish since either of these sources may have been used historically. 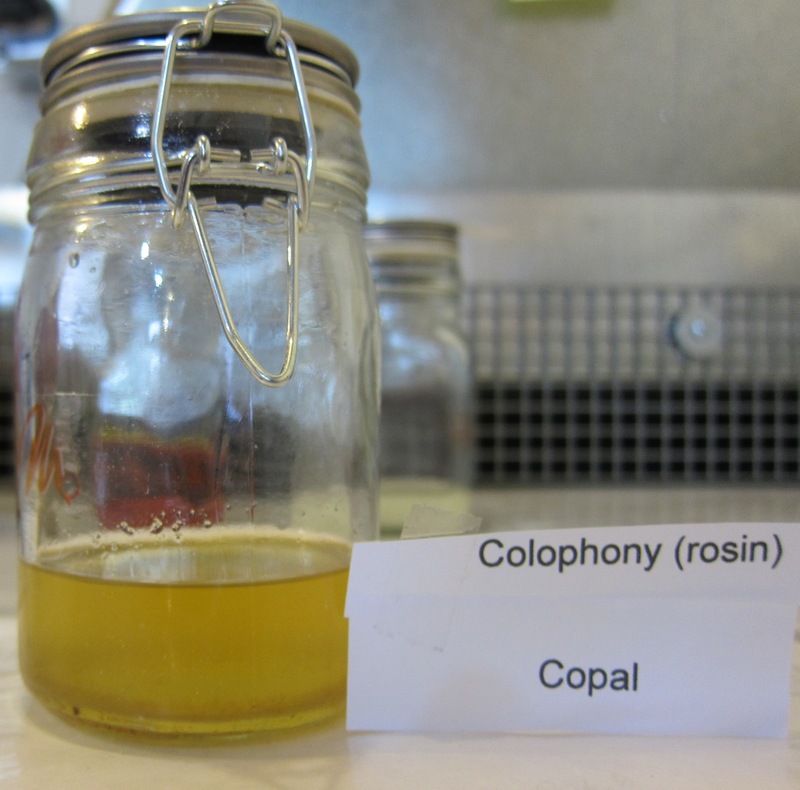 For further information on this resin and many others I highly recommend Jean Langenheim’s book on Plants resins. It s essential reading for anyone studying artist materials derived from plants. The boards now have six layers, so they were sanded smooth. In this part of the process another six layers had to be applied. 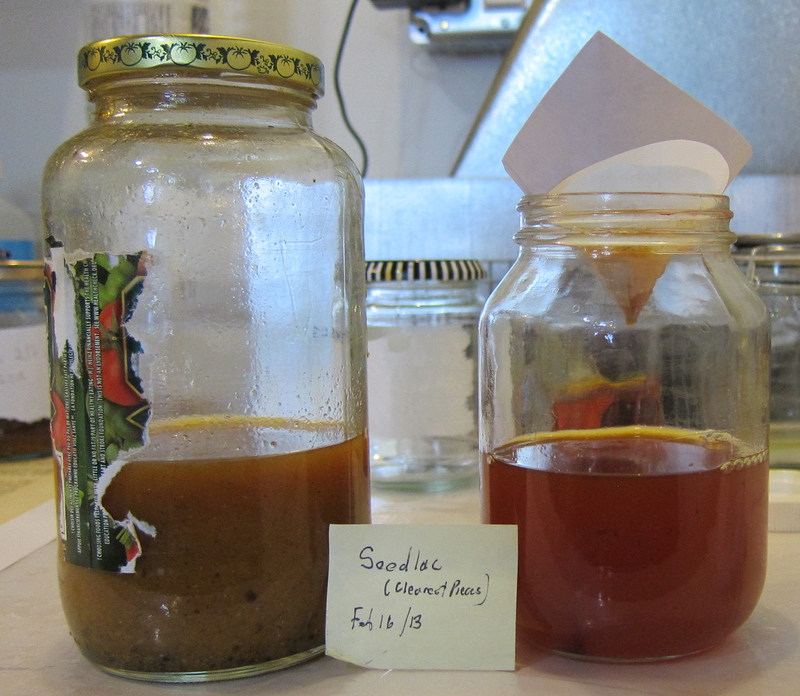 As we explained, there are two different groups of panels, the one with the Venice turpentine mixed with the seedlac, the other one with the pure seedlac. It is interesting why they would choose to use these softer layers between the seedlac layers. Because it is softer it has more elastic properties. For example because of this elasticity it should be more capable of responding to shrinkage and swelling of the wooden substrate. 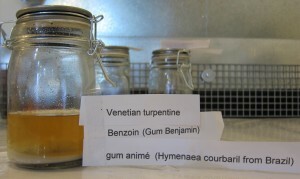 Another reason could be that it is used to reduce the tension between several layers using the Venetian turpentine. 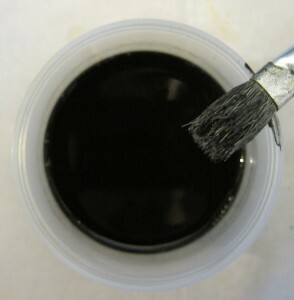 Judging by this hypothesis the Venetian turpentine layers are used between layers of thick saturated black lacquer and a lacquer that contains about half of the amount of pigment used as in the first layers. In this case the Venetian turpentine layers could act as a buffer between these different kinds of lacquer. Still if this was the reason they used these softer layers why did they use six of them. Well, returning to the physical lacquering of our panels the two groups show several differences both in the way of application and visible appearance. The pure seedlac flows a lot better and covers the piece quit well, leaving no visible brushstrokes. The seedlac containing Venetian turpentine is the other way around it flows less well than the pure seedlac, leaving a rather mat surface and visible brushstrokes. For the future it will be interesting to see if there is any difference in the way they degrade. Yesterday all three of the sample boards were sanded smooth. Having this done the application of the following layers could be started. For the common usual red panel and the light pale red panel this procedure is the same. These panels were covered with eight layers of pure seedlac, after this the panels had to dry for at least 12 hours. Concerning the deep dark red panel, pure seedlac was be prepared before mixing with dragon’s blood. Bit by bit it had to be added to the seedlac till a nice blood red colour was reached. 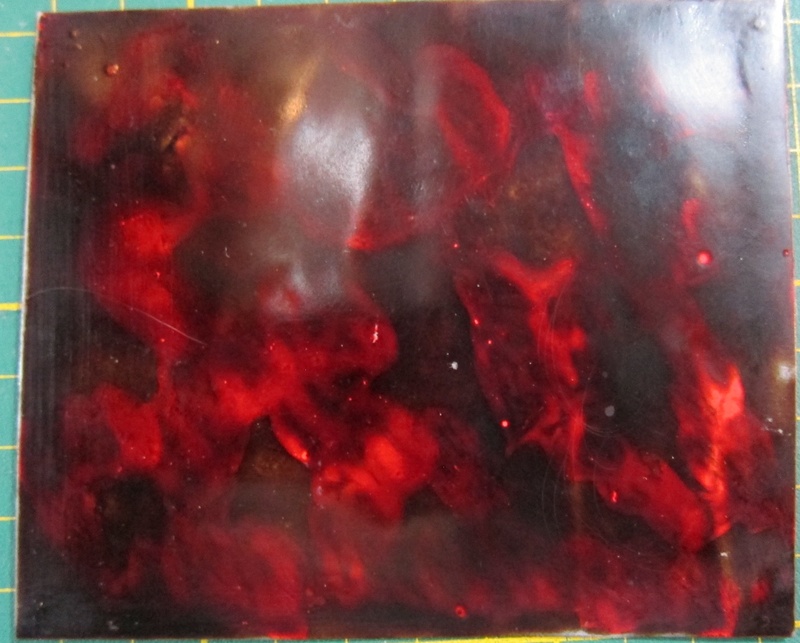 This mixture of the well dissolved dragon’s blood and seedlac was applied to the panel until it till it was well covered with it. In total we used 5 layers of this red lacquer. 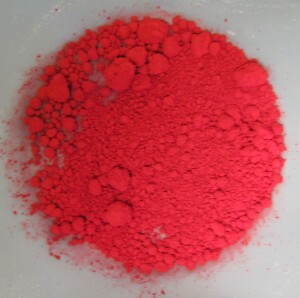 In comparison the recipe tells the following: “When you have laid the common red as before directed take Dragonsblood reduce it to very small dust or powder and as your judgement and fancy are inclined, mix it a little at a time with your varnish; and indeed you will find, that a very small portion will extremely heighten colour, as also that every wash will render it deeper, but when you find it has acquired a colour almost as deep as you design, forbear you must remember you have more varnish of seedlac to lay on which will add and supply what is wanting. 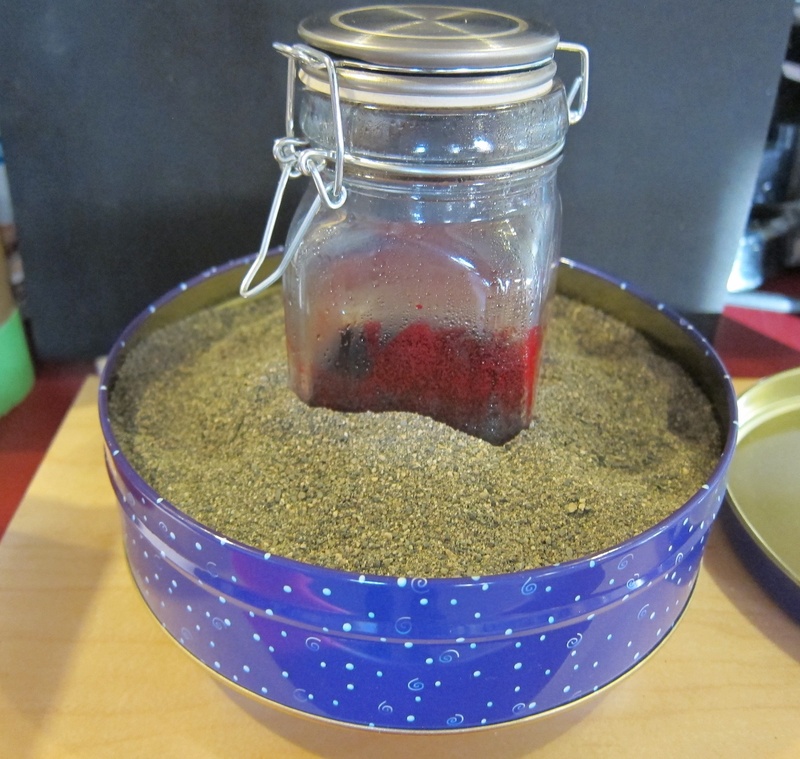 Consider therefore how many washes are still to be laid, and according to that use your Sanguis Draconis or Dragonsblood.” Considering this explanation we made the dragonsblood mixture some bit lighter as what we had actually in mind considering the following seedlac layers. 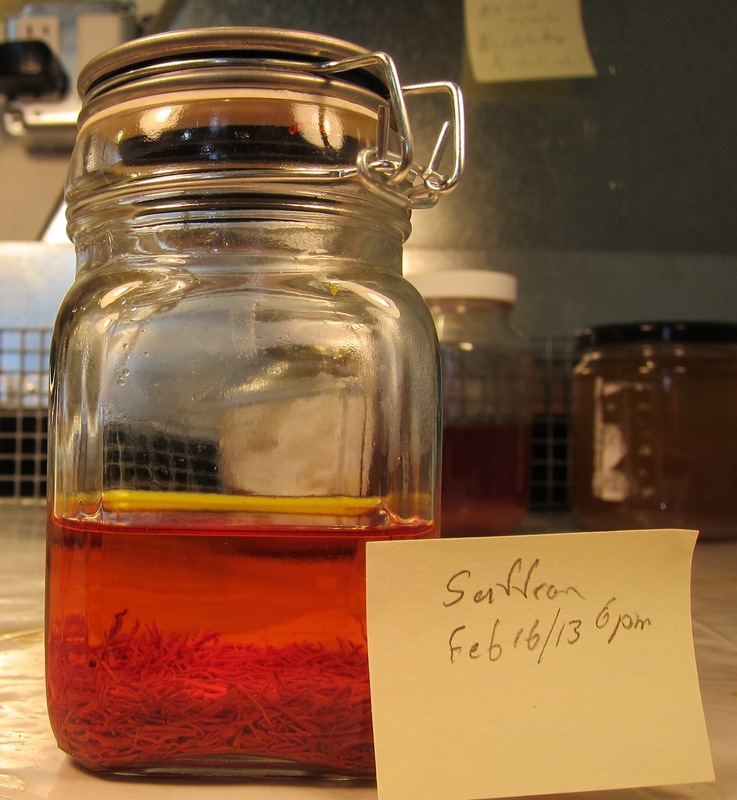 Four days ago we soaked the precious genuine saffron in the alcohol. Today the time has come to strain the saffron and to add the other components to it to make the actual varnish. We have some questions about this varnish; first when we look at the title it should be a yellow coloured varnish what we are preparing, but judging by the components used it would be a much darker and rather red colour. The colour of the saffron has an orange red colour with a yellow tint, the dragon’s blood is red, and the aloe has a brownish colour with also a yellow tint. 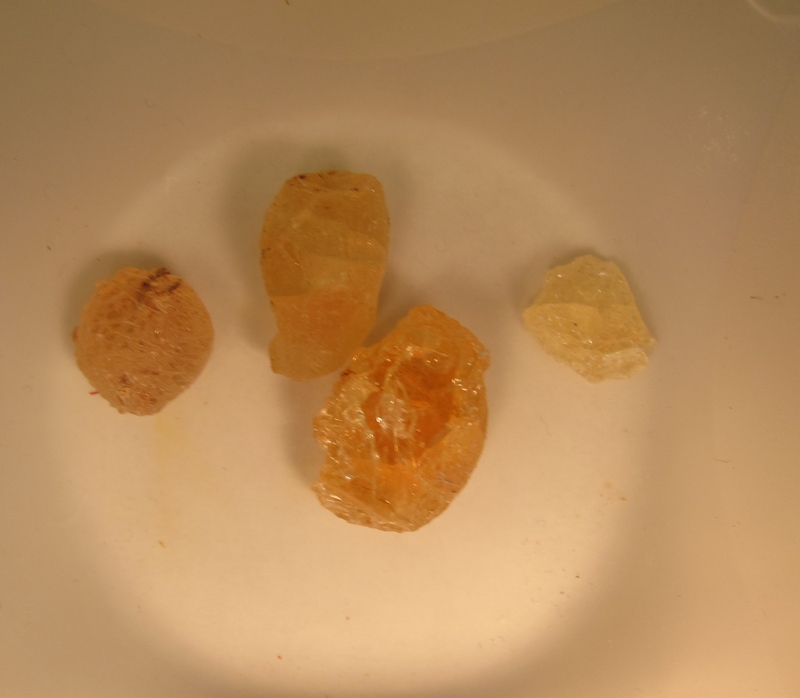 On the other hand is the amount of resin in the mixture is minimal. Dragon’s blood is a red coloured resin, the Saffron is a dye and the aloe is a thickened juice of the leaves of different types of the Lilacaceae group and could act as a resin. 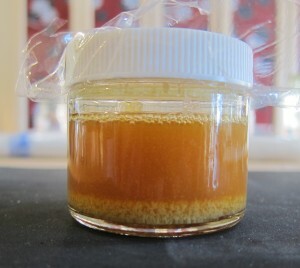 Still the amount of resin is very low and we are really curious if it is capable on forming a film on our sample board. 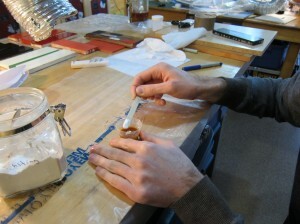 Also William Salmon gives no instructions how the layers should be built up, he only explains how to make this varnish. We expect this varnish to be applied as an upper layer, on the other hand it should not be a high gloss lacquer because it contains no hard resin. For now the varnish will be heated for a week. Next we will be doing several experiments with this varnish on different grounds to find out how this varnish should or could be used. In the same context as the yellow varnish described above William Salmon gives also for this varnish no explanation on which ground it should be used. Although the varnish itself has to be heated till next week we are already preparing some experiments to do with it find out. 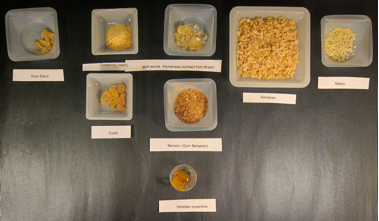 One of these experiments is to test it on a common usual red ground (Stalker and Parker) so we have been preparing a sample board with the seedlac/vermilion mixture as described before. We used only the pigmented layers for this experiment. Not too much to post today as we were pretty busy making varnishes. 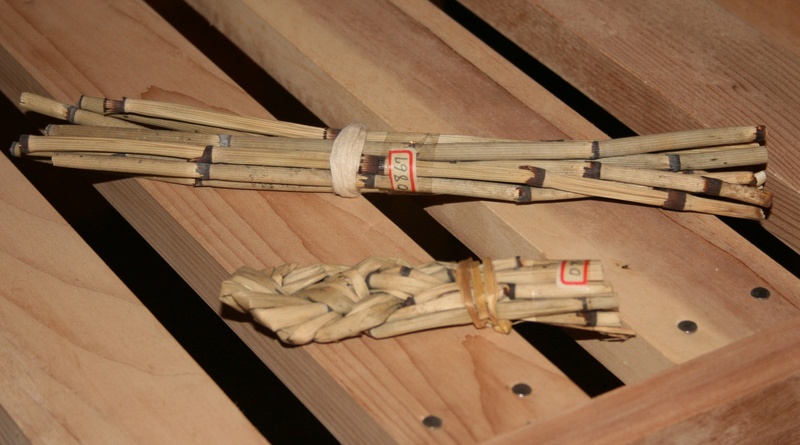 I received a note about my way of putting horsetail in a bundle to use it like a glass bristle brush. It was felt that it would scratch the surface used this way. I have to agree that it indeed does scratch the surface, so obviously could not be used for fine finishing. 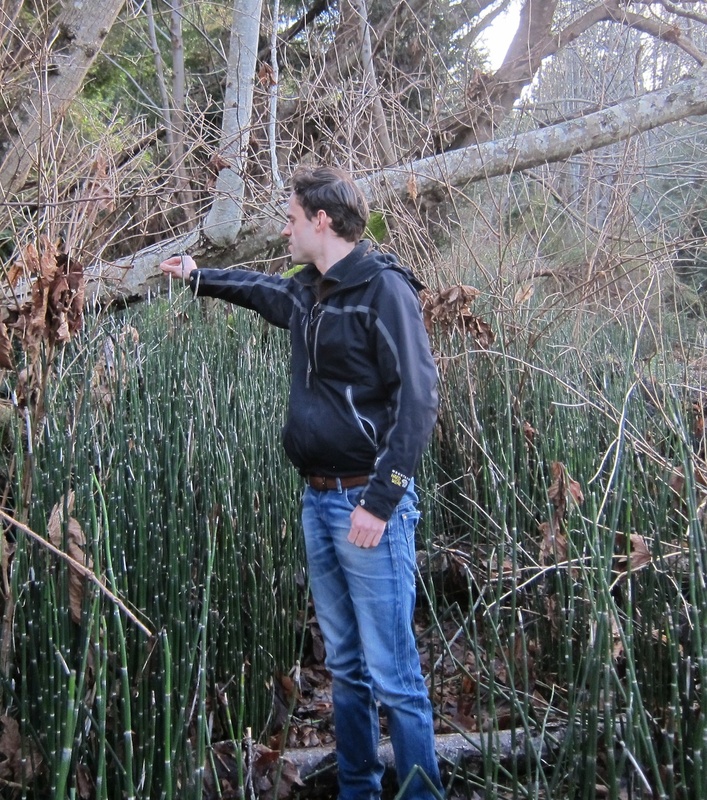 I am lucky that I have lots horsetail year round to so can prepare it fresh avoiding the need to soak it. My usual method of using it is to cut off the nodes, slit the tube so it can be opened up. The pieces are clamped between two boards and left for several days to dry. Then I choose the smoothest pieces and glue them to a small block of wood. This makes a great reusable sanding block. 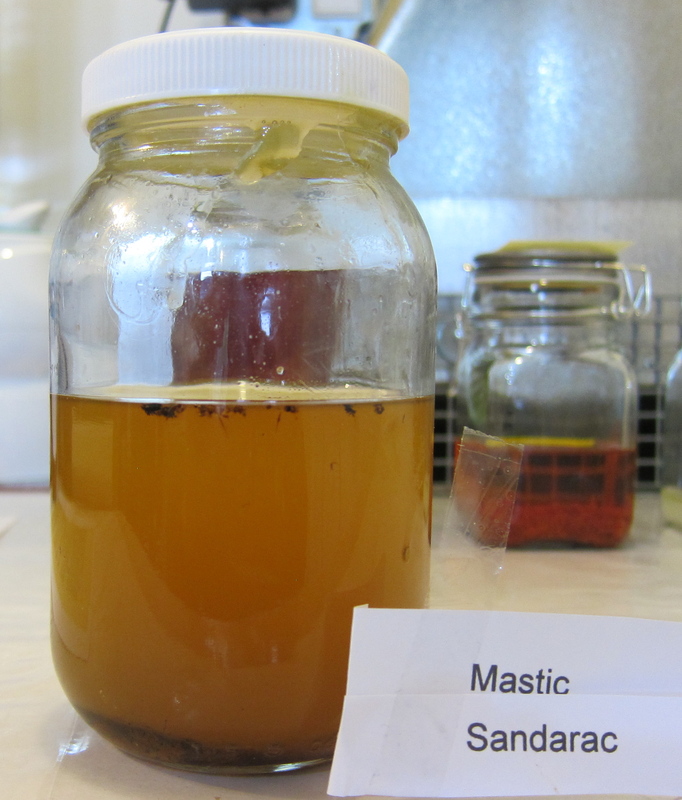 The debris from sanding varnish does not clog so a block last indefinitely. I have never used it this way but look forward to trying it. Thanks for the advice. 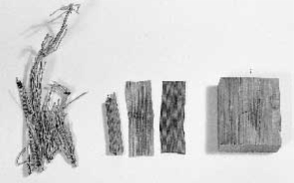 Here are a couple of photographs of the way horsetail was used in Japan. The black and white photo is the only one I happen to have of my sanding block method. Hopefully by the end of this blog we will have a new block to photograph. Today after laying the first six layers of black varnish the sanding procedure had to be carried out. Each sample board was sanded with a p600 grit sandpaper. All irregularities had to be sanded out as well as possible brushstrokes. After the first four layers of red varnish had been laid on, the sample board has to be sanded off smooth, like the recipe says “…and if your reds are full, and in good body to your liking, rush it very smooth” Due to the toxic pigment used HgS (mercury sulphide) we applied two additional layers of transparent seedlac so no mercury dust is created during sanding. For the following day the sanding procedure will be the same for both the black and red panels. For the white coloured lacquer first the isinglass size had to be prepared as described before. 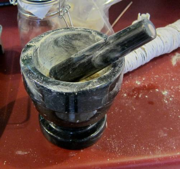 After it had been strained and warmed up again the lead white pigment had to be mixed with it. 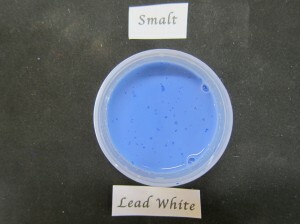 In the beginning the mixing of the lead white with the Isinglass size did work very well. 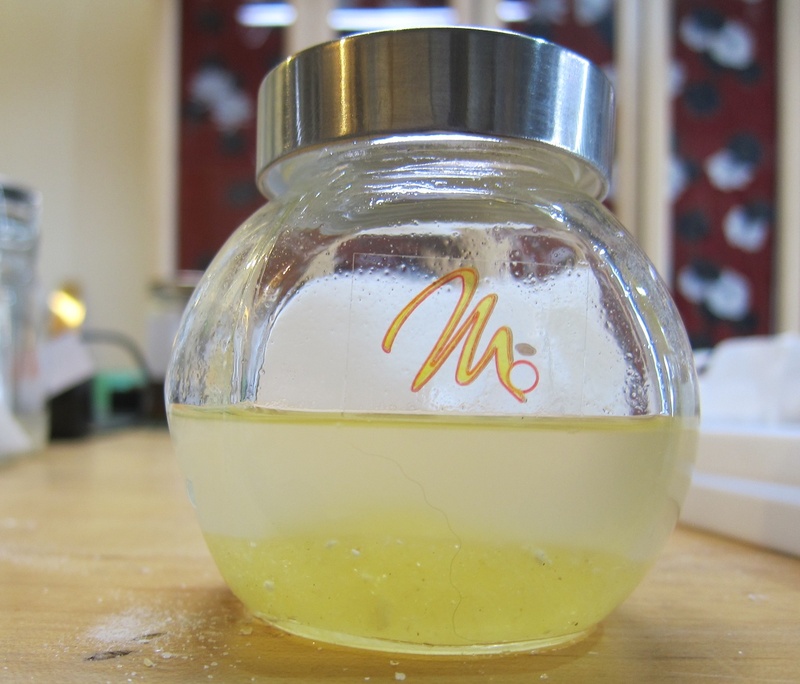 The viscosity of the Isinglass was too high by which a good dispersion between the two components was not possible. For this reason the lead white pigment caked to each other making clumps in the varnish. 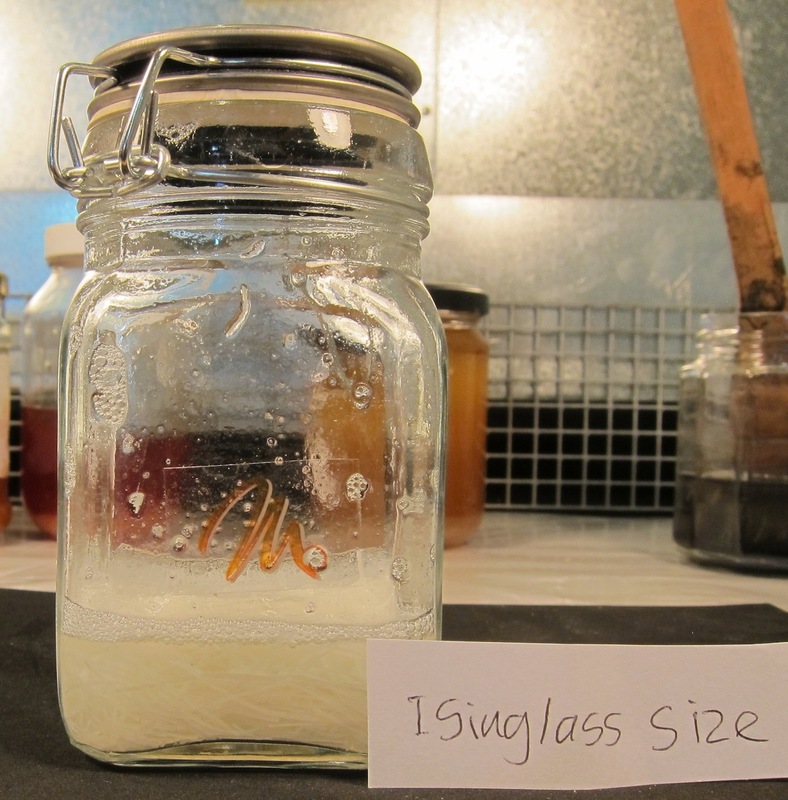 It was obvious that the viscosity of the Isinglass had to be lowered to allow dispersion to conform to our wishes. Perhaps we had not heated the isinglass long enough when we made it. (we warmed it approximately 30 minutes). We made a new batch, heating the size for two hours during preparation. 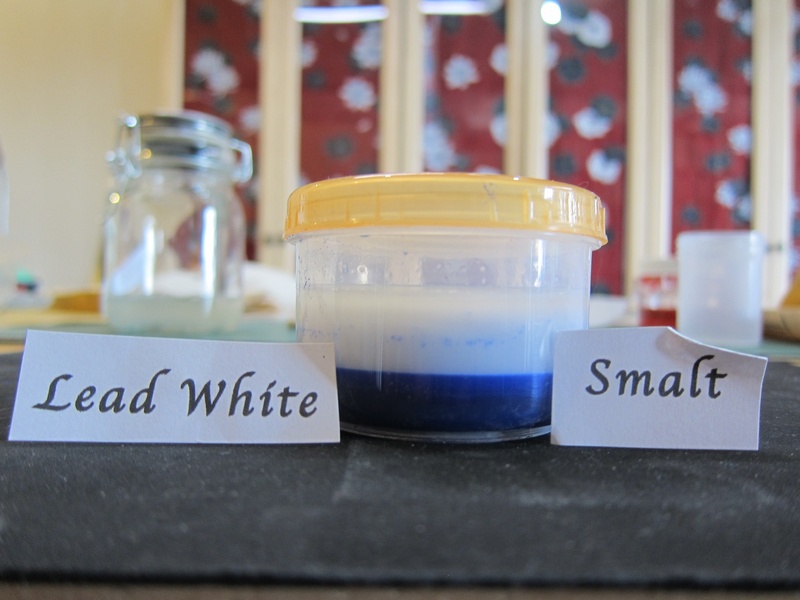 The result worked out positively, the viscosity of the Isinglass was lowered and the lead white pigment could be mixed easily with it. 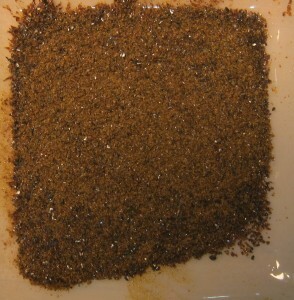 Three layers of this mixture were applied.